Inspired by various quilts in the Maryland Historical Society's Collection, this quilt was designed, hand-appliqued and hand-quilted by 74 members of the Baltimore Appliqué Society. 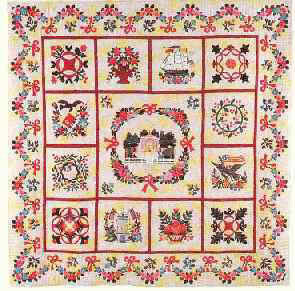 The Baltimore Appliqué Society formed to provide technical and financial support to the Maryland Historical Society and to preserve the art of applique. All profits from the salee of raffle tickets and pattern books (available through the Maryland Historical Society) are donated to the Maryland Historical Society's quilt preservation/textile facility. The second printing of the "City Springs Commemorative Pattern Book" is available for $12.00 from the Maryland Historical Society. You can visit the Maryland Historical Society Gift Shop at 201 West Monument Street, Baltimore, Maryland 21201-4674, or call at 410-685-3750, ext. 305. The first printing of the "City Springs Commemorative Pattern Book" was SOLD OUT. However, the Board of Directors of the Baltimore Appliqué Society authorized the Maryland Historical Society to reprint the "City Springs Commemorative Pattern Book"! We all agreed that we wanted this book to be available to quilters and collectors, and to continue to raise funds for the Maryland Historical Society, as was the book's original intent. Patterns have been designed and adapted from antique Baltimore album quilts in the Maryland Historical Society's collection. We are glad that BAS continues to benefit MHS.